Home » Pet vs. Petted – Which is Correct? If you met an adorable puppy yesterday and rubbed its belly and scratched its ears, would you say that you pet the dog, or petted the dog? Some speakers might use either, and most English users would understand them either way. For written contexts, though, there is a clear difference between these words. What is the Difference Between Pet and Petted? In this post, I will compare petted vs. pet and use each of these words in at least one example sentence, so you can see them in their proper context. I will also demonstrate a mnemonic device that will make it easier to choose either petted or pet, depending on the context of your sentence. What does pet mean? The word pet has a few meanings, but, in this article, I will focus on its use as a verb that means to stroke or caress, usually in regard to a domestic animal. When you pet a cat, for instance, it is likely to either start purring or bite you, depending on whether or not it wants to be touched at that moment. Pet is a regular verb. It can be conjugated into various tenses by adding -s, or doubling the T and adding -ing or -ed. Since it is a regular verb, there are no real surprises. Brian enjoyed his date with Angela, but became a little annoyed when she stopped to pet every single dog they saw. What does petted mean? As you saw from the chart above, petted is the simple past (and past participle) conjugation of the verb pet. Some speakers of English use pet as the simple past tense, as well. While this usage is common in many informal contexts, it is not yet accepted as standard in formal writing. “I just petted you five minutes ago; let me eat my dinner in peace!” Karen told her cat. After they had petted as many dogs as possible, Brian and Angela left the beach and walked back to their car. 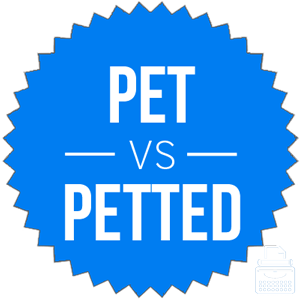 Now, let’s go over a trick to remember pet vs. petted. Pet is a present tense conjugation of this verb. Petted is the main past tense conjugation. Use pet in the present. Use petted in the past tense. Since petted rhymes with other past tense verbs, like headed, bedded, and wedded, it should be simple to remember that petted is a past tense verb, as well. Is it pet or petted? Pet and petted are two conjugations of a verb that means to stroke or caress. Pet is a present tense conjugation. Petted is the simple past tense version. Pet is sometimes used in the past tense in informal situations, but for written English, you should stick with petted. Is petted a real word? Yes, petted is a real word. In fact, petted is the correct past tense form of to pet. Is petted a word? Yes, petted is a wordSee above. What is the past tense of pet? While many think pet is the past tense of pet, it is actually petted. Pet is a regular verb, so it follows the standard conjugation pattern of English verbs. Do you pat a dog or pet a dog? That depends what you mean? If you were to “pat” a dog, you would touch quickly and gently the dog, usually on the top of the head. If you were to “pet” a dog, you would rub the dog back on forth. 1 What is the Difference Between Pet and Petted?